Shocking reports are coming in saying the Obamas took an active interest in the Jussie Smollett case, who is charged with staging a fake hate crime committed by Trump supporters. In fact, mainstream media sources say Michelle Obama’s top aide was caught interfering with the legal process in an attempt to help the beleaguered actor. You don’t want to miss this. Just what do the Obamas have to do with the Jussie Smollett case? Well, according to text messages and phone calls reviewed by the Chicago Sun-Times, three days after Smollett claimed he was attacked by two men wearing MAGA hats, Michelle Obama’s former chief of staff Tina Tchen contacted Cook County State’s Attorney Kim Foxx about the Jussie Smollett case. Tchen told Foxx, who would be the lead prosecutor, that the Smollett family didn’t want the Chicago Police Department in charge. Tchen advised Foxx to turn the case over to the FBI. A few hours later, Foxx received a text from a relative of Smollett, who said she’d received the number from Tchen. “They had no doubt about the quality of the investigation, but believed that the FBI would have a tighter lid on the information,” said Foxx. “OMG this would be a huge victory,” the family member texted back. Now, why would the family say “this is a huge victory” if the FBI takes over? More on that later. First, this is why Cook County State’s Attorney Kim Foxx had to recuse herself from the case after it was found Jussie Smollett was the alleged perpetrator of a hoax hate crime. Foxx was compromised by Obama’s former top aide Tina Tchen. She could no longer claim to be impartial. But it also brings up many questions reporters are asking about the Obamas involvement in the first place. What makes matters worse is that Michelle’s former chief of staff recommended the FBI take over. Potentially, the FBI would be much easier for the Obama machine to control. We all know how the Obama left-overs are still scattered in places of power at the FBI and DOJ. This is why the Smollett family member is celebrating the possibility of the FBI taking control. “Did Michelle Obama want to keep the phony narrative going, about Smollett being the victim, for his sake and to whip up power for the Obama political machine, which thrives on this kind of divisive politics? Well, Obama sure did, given his behavior at Ferguson. So right now, that’s what it sounds like,” Monica Showalter concludes. Nothing different than “collegegate” where powerful & rich intervene… & it now assures me that the FBI IS DEEP STATE & PARTISAN FOR DEMOCRATS.. Michelle Obama knows who in the @FBI would protect Jussie just like they protected Hillary! WAKE UP @realDonaldTrump! Weed them out! 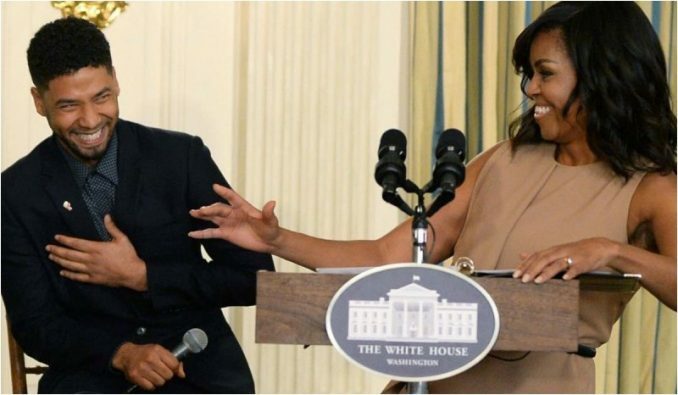 Michelle Obama’s former Chief of Staff tried to INTERVENE in the Jussie Smollett case….when they thought he had been attacked by a Trump supporter! The Obamas are very involved in the race narrative in America. As president, Barack Obama time and time again used his office to promote this notion that America is a country with a huge race problem. Obama pretended as if the 1960’s Civil Rights Movement never happened. He helped spurn hatred for police officers and saw everything from a racist lens. The Obamas and their cohorts need to keep perpetuating fake racism in America, and the Jussie Smollett case fits perfectly in that mold. But they needed to make sure it was handled with kid gloves so they could spin it the way they wanted it to go. As we all know, the good men and women of the Chicago Police Department didn’t let the Obama machine take over. And for that, all Americans who care for truth and justice owe them a huge debt of gratitude.